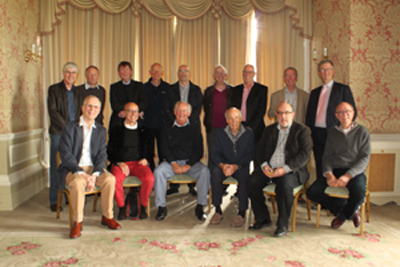 On the 11th May 15 alumni plus partners returned to Oxford Brookes for a 40 year reunion. They had all met at the Oxford Polytechnic while studying post-graduate courses in Town Planning. Members of the group travelled from all over England and Wales to meet up, one alumnus even travelled from California! The day consisted of a hot lunch at Headington Hill Hall and a tour of the new buildings by a current planning lecturer Tim Marshall. After the tour they went onto the Vicky Arms by the river. During the day lots of stories were shared about the old times and what they were currently doing and what their children were doing! There was also a romantic story with one couple Jon and Pippa Pender '75 who met at the Polytechnic (but were on different courses) and have since had a family and live in Cornwall. The organiser Tony Baden ’75 who until recently was a visiting fellow at Oxford Brookes and an advisor to the planning department says they are still in contact with 24 out of 28 of their former classmates and they look forward to all getting together again in 2015. "Quite surreal after so many years but very interesting seeing what everybody has done." "It was good to meet everyone again. 40 years? Where did the time go!" "It was very good despite the lousy British weather. It was especially good to have widened the group again – by the time we meet in 2015 we may have even more!"